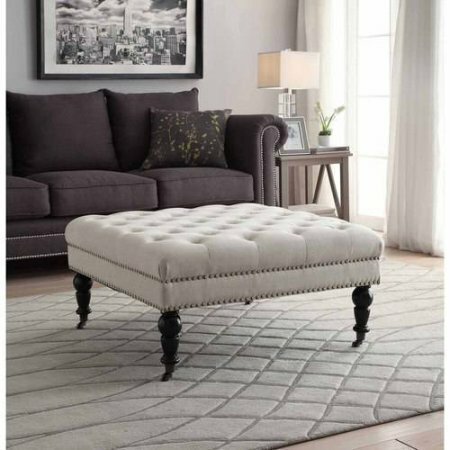 The Linon Isabelle Square Tufted Ottoman in White makes a stylish and versatile addition to your home's decor. Wonderful for use as an ottoman or coffee table, it has a tufted top upholstered in a natural linen fabric. Burnished bronze nail heads accent the side, while turned dark espresso finished legs complete the look of this square ottoman. It provides extra seating when entertaining guests or you can place your favorite blanket, books or magazines on it for an elegant touch. It is ideal for a living room, office or bedroom and offers a world of versatility and function. ◘Dimensions: 34.63"L x 34.63"W x 17.72"H.
If you have any questions about this product by Linon*, contact us by completing and submitting the form below. If you are looking for a specif part number, please include it with your message.